162 pp. Oxford University, $14.95. So much has been said about Margaret Thatcher that the only thing left to do is to say less. Cannadine’s life of the strident and indomitable prime minister is quick as a sprint and a joy to read. 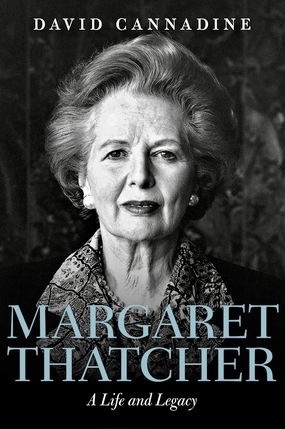 Initially prepared as an entry for the Oxford Dictionary of National Biography, Cannadine’s Thatcher appears here in a stand-alone volume of 162 lively pages. In them the author, a prolific biographer and historian, synthesizes decades of scholarship on the most significant figure in British politics since Winston Churchill. Cannadine persuasively concludes that Thatcher rivaled Churchill in stature but not achievement. Her convictions and force of personality gave rise to their own movement (Thatcherism), yet her signal foreign policy success was an anachronistic colonial adventure in the Falklands. She helped win the Cold War but was “emphatically on the wrong side of history” in favoring apartheid South Africa and opposing German reunification. Domestically, Thatcher presided over years of unemployment and economic policies that coddled the rich. Yet, like Ronald Reagan, she fundamentally reoriented her country’s politics. Ferocious and bold, Thatcher is a case study as much in willpower as sharpness of tooth. In “Pillars of Justice,” Fiss, an eminent constitutional scholar, offers a warm and generous reflection on the men and women who shaped his life in the law. The book collects brief essays on 13 judges, attorneys and law professors who provided inspiration and friendship. The common theme is a reverence for legal liberalism in its various forms: Yale Law School, where Fiss taught for many years; the Department of Justice’s Civil Rights Division, where he began his career after clerking for Justice William Brennan; the “halcyon days of the Warren court”; and Brown v. Board of Education, which Fiss views as the Supreme Court’s key triumph and promise. The book contains as much autobiography as portraiture, and it begins with an arresting anecdote. Traveling to Washington, D.C., as a high school student, Fiss visited the court to observe his first oral argument. Who should he see at the lectern but Thurgood Marshall himself, arguing Brown. Marshall is one of three judges profiled here, along with Brennan and the Israeli jurist Aharon Barak. John Doar and Burke Marshall represent the practical idealism of the 1960s Justice Department. In 1963, Doar gained fame by helping to quell a brewing riot in Mississippi after the assassination of Medgar Evers. A photo of that tense moment appears on the book’s cover. Fiss’s entries on his fellow scholars, by contrast, can unfortunately veer into small-stakes law school politics, or worse, arcane theories and stale hypotheticals that have little application outside Yale’s lofty walls. Much is made of the clever titles of law review articles. And somewhere between Fiss’s account of “fundamentality without fundamentalism” and the well-worn “ticking time-bomb” scenario to discuss torture, many readers will find their attention wandering. The early chapters of this book are best. 353 pp. Yale University, $32.50. This biography of the nation’s first president stands out for its rich prose. Rhodehamel writes of Washington’s “legendary courage and his splendid person,” and explains that he possessed “that rare and inexplicable power to make others trust and obey him. Many discovered that they actually loved him.” Rhodehamel’s jaunty writing makes for a highly entertaining book. Here he is on the Continental Army’s surprise attack at the Battle of Trenton: “The Americans charged aggressively, emerging out of the swirling snow. Washington led from the center.” The general’s instinct to find the middle of the action worried his men. It also inspired them. Rhodehamel contends that a tension between ambition and reluctance to serve produced Washington’s greatness. He eagerly sought out commands early in his career, but he hesitated to assume the presidency and could not wait to be free of it. In office, he used his tremendous prestige to consolidate American nationhood at an uncertain moment. Washington was not perfect: He freed his slaves in his will but had been a lifelong slaveholder; and while he decried partisanship, he himself became a fierce Federalist. Yet even flawed, Washington was both the projection and embodiment of the citizenry’s deepest aspirations.